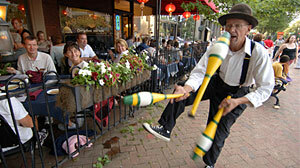 A performer juggles outside a restaurant in Pack Square, Asheville, N.C. Business leaders in the North Carolina mountain city say a visit from the Obama family will bring plenty of favorable publicity. President Obama and his wife head to Asheville, N.C., this weekend for a short vacation that is vastly different from last summer's trip to Martha's Vineyard in Massachusetts and the Christmas journey to a luxurious vacation rental in his childhood home state of Hawaii. The city on the edge of the Appalachian Mountains features a funky and eclectic downtown, more than 30 art galleries, a large culinary scene and one of the most spectacular estates ever constructed in this country. Its location just off the famous Blue Ridge Parkway, which connects the Great Smoky Mountains National Park with the Shenandoah National Park, makes it a great launching point for tourists looking to hike, bike or go rafting. For Obama, the city also offers something else: a chance to appeal to everyday families and generate favorable publicity in a potential swing state. "Asheville has the virtue of being a place where average Americans go on vacations," said Darrell M. West, director of governance studies at the nonprofit Brookings Institution in Washington, D.C.
"It's not an upper-income place like Martha's Vineyard. And so it's a much safer vacation spot from the standpoint of public perception. Asheville will have more mainstream demographics and political affiliations. It's more of a snapshot of America than Martha's Vineyard." Obama got 49.9 percent of the vote in North Carolina in the 2008 presidential election (vs. 49.5 for Sen. John McCain), the first Democrat to win the state in more than three decades. President Bush won the election there by 12 percentage points four years earlier. Democrats have their sights set on the Tarheel State for 2012 and would love to keep it in their column, a point driven home by the numerous visits in the past 16 months by the president, first lady Michelle Obama, Vice President Joe Biden and his wife, Jill Biden. But the party faces challenges there within its own base from union members disappointed with three moderate Democratic congressmen who sided with Republicans against Obama's health-care bill. Labor groups have formed a third party and are seeking candidates for the ballot. Also, unemployment in the state was at 11.1 percent in March, compared to 9.7 percent for the country. Obama spent a few days in Asheville in October 2008 preparing for the second presidential debate against McCain. During that trip, he stayed at the Grove Park Inn Resort and Spa and is rumored to be staying there again this time. During his last stay, the hotel's grand ballroom was transformed into an exact replica of the debate hall so that the he could better prepare for the debate. This trip is likely to be a bit more relaxed. 48 Hours in Asheville, N.C. The Obama family has no public schedule for the weekend but here are some suggestions for what they -- or anybody else -- can do with 48 hours in Asheville. The city of 69,000 residents has more art deco architecture downtown than in any other southeastern city outside Miami. But the real architectural masterpiece is the nearby Biltmore Estate. The 250-room mansion, built by George W. Vanderbilt and completed in 1895, is modeled after the 16th century chateaux Blois, Chenonceaux and Chambord in France's Loire Valley. The National Historic Landmark is the largest private residence in North America and simply awe-inspiring. The grounds of the original 125,000-acre estate were designed by Frederick Law Olmsted, the creator of New York's Central Park. At the entrance to the estate rests Biltmore Village, a planned community that offers plenty of one-of-a-kind shopping opportunities. The village has tree-lined streets, brick sidewalks, open air dining and plenty of historic homes dating back to the 1900s, although they aren't as lavish as the Vanderbilt estate. Enjoy history. It's time to get wet. Head up to Sliding Rock, Mother Nature's own version of a giant waterslide. The mountain waterfall flows over a 60-foot, flat, sloping boulder making the perfect slide. People line up to slide through the chilly waters and then splash into an eight-foot deep pool. There are even lifeguards in the summer months. Adventure is great but if shopping is your thing, check out the local crafts at the Folk Art Center on the Blue Ridge Parkway, just outside of town. Many of the craftspeople are eager to discuss their craft with visitors. There are also plenty of thriving galleries downtown offering all sorts of arts. John Cram owns the New Morning Gallery and Blue Spiral 1, a fine arts gallery and two clothing stores that emphasize U.S.-made goods. He also took over a vacant adult movie theater a few years ago and now shows independent films there. He has been one of the people responsible for transforming the city into the destination it is today. "I moved here when there wasn't even a freeway in 1972," Cram said. "I matured and the town matured in the same time." Cram is active with the local conservation movement and says the region has "great camping, phenomenal hiking and river rafting." "It's easily accessible and it's in the middle of the beautiful mountains," he said. After a day of hiking, shopping or sightseeing, consider a treat to fill your stomach (or wait for an after-dinner sweet.) Either way, the perfect stop is the French Broad Chocolate Lounge downtown. Try the liquid truffles, an opulent, ganache-based hot sipping chocolate. Owners Dan and Jael Rattigan met in Minnesota where he was in law school and she was in business school. They both dropped out and moved to Costa Rica and started a small café, Bread and Chocolate. A year and a half later, in 2006, they moved back to the United States and chose Asheville. Dan Rattigan said the city "really stuck out to us as the epicenter of the food movement" and appealed because of the strong support for small, local businesses. That and a vibrant culture with plenty of artistic people. "It really struck me seeing dads with their kids on the shoulders walking down the street," Rattigan said. "It's a real community." Plus every Friday night there is a drumming circle downtown. "I've seen little kids dragging drums that are almost as big as they are," he said. For tourists, Rattigan suggested a drive on the Blue Ridge Parkway and a trip to one of the city's tailgate or farmers' markets. "We have such a vibrant culture of food here," he said. "It all starts with the farmers and the artisans." Markets are all across the city throughout the week, but Rattigan's favorite is the Asheville City Market on Saturday mornings downtown. "I go religiously with my family every week, bring the kids and play," Rattigan said. "It's the way I plan my meals for the week." But if you are on vacation, you might want to have somebody else cook for you. If seared scallops, roasted duck breast, house made chorizo or Georgia quail whet your appetite, go visit Jacob Sessoms, chef and owner of Table who was named one of 20 semifinalists for a 2010 James Beard Foundation Restaurant and Chef Award. For a bit of authentic Southern cooking, check out local institution Tupelo Honey Café. Check out the cheesy grit cakes, stuffed with a blend of cheeses, drizzled with a spicy red chili sauce, the blackened catfish or the buttermilk fried pork rib chop. But be prepared to wait. Crowds line up, especially for Sunday breakfasts, at this non-reservation eatery. For something completely different, try one of Rattigan's favorite spots: Zambra, a tapas restaurant serving up a mix of Spanish, Portuguese, and Moroccan dishes. "The chef is really great at using the best of the ingredients for local purveyors. And their wine list is phenomenal," Rattigan said. For a touch of the Obama fame, swing by the 12 Bones Smokehouse, where the president had a barbecue lunch the last time he was in town. Other great dining options include: Early Girl Eatery for breakfast (get the biscuits), the Well-Bred Bakery and Café in nearby Weaverville for breakfast or lunch and Cucina 24 for fantastic Italian food. Finally, Asheville has plenty of ties to the literary world worth exploring. F. Scott Fitzgerald, author of "The Great Gatsby," stayed at the Grove Park Inn while his wife received psychiatric treatment at a nearby hospital. While waiting, Fitzgerald is said to have drank on the inn's large porches while admiring the view or seeking the romantic company of a number of young ladies. One local tale says that a picture once hung in the Grove Park labeled as "F. Scott Fitzgerald and wife Zelda." Despite the caption's claim, in reality the photograph depicted Fitzgerald and one of his lovers. Ashville is also home to Thomas Wolfe, author of "Look Homeward, Angel" and "You Can't Go Home Again." But the town hasn't always been so friendly to him. A wave of anger swept through Asheville after "Look Homeward, Angel" was published in 1929. Locals read a book portraying their town as less than desirable and describing them as ignorant and unfriendly. Anger and even threats against his life kept Wolfe away until 1937. Today, the city embraces him with the annual Thomas Wolfe Festival, a four-day event built around his Oct. 3 birthday. The festival highlights the life and times of the author through workshops, writing contests, tours and theatrical interpretations of his work. The 29-room boarding house his mother ran is also now preserved as a state historic site and memorial to the author. Why Did Obama Choose Asheville for Vacation?